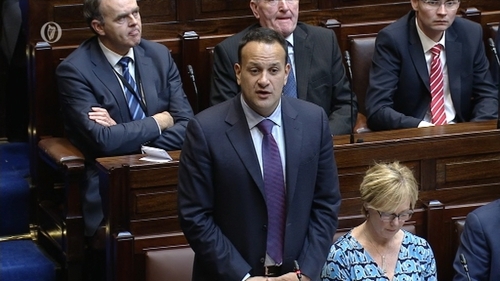 Taoiseach Leo Varadkar has said the Good Friday Agreement is not up for renegotiation, after DUP leader Arlene Foster said it could be altered to accommodate a final Brexit deal. In an interview with the Daily Telegraph, Mrs Foster said the deal was not a sacrosanct piece of legislation. "Things evolve, even in the EU context. "There has been a lot of misinterpretation, holding it up as a sacrosanct piece of legislation." The comments drew widespread criticism from all sides in Leinster House. However, speaking later to reporters Mrs Foster defended her remarks and said they had been '"blown out of proportion". She said: "I was simply reflecting again that there have been changes to the Belfast Agreement since it came into force 20 years ago. "We have had the St Andrews Agreement ... in 2006. We have had the Stormont House Agreement. We have had many agreements since then and that is all I was really reflecting." When asked if she thought there needed to be a change in the Good Friday Agreement, Ms Foster replied: "In what way?" The DUP leader added: "What I said was there has been a misinterpretation of the Belfast Agreement. People love to look at the Belfast Agreement as the reason why their arguments should be put to the fore. "All I am simply saying is if you are talking about the Belfast Agreement, it is important that you remember that at the heart of that is the consent principle, which very clearly says that Northern Ireland is part of the UK until such times as the people of Northern Ireland say otherwise." Sinn Féin leader Mary Lou McDonald raised the remarks in the Dáil, saying they were "dangerous and reprehensible" and revealed a "reckless" attitude to the agreement. Ms McDonald said that Mrs Foster may need to be reminded that the agreement was endorsed by people across the island. Mr Varadkar responded by saying that the Government defends the primacy of the agreement and sees its role as co-defenders of the agreement. He said "it is not a piece of British legislation, it is a piece of international legislation" and it is an agreement that was put to referendum. He said it could only be changed with the consent of the British and Irish governments and the consent of people in Northern Ireland. He said it is not up for renegotiation. Earlier, Tánaiste Simon Coveney said Mrs Foster was "wrong in this case". Mrs Foster also praised what she called Boris Johnson's positive vision for Brexit and said she could work with him if he became prime minister. She said: "I think the reason why so many people are turned off by Brexit is because they are being fed a diet of negativity - whether it's infighting, Brussels, being disrespected by people over there. "We haven't been able to talk about the aspirations for the nation, we've spent so much time arguing about what's happened, is it going to be a disaster for Ireland in inverted commas, instead of actually focusing on what we can achieve in the UK with the Brexit negotiations." Party colleague Jeffrey Donaldson said it is time to stop "fixating on the backstop" and being pessimistic about the prospect of getting a Brexit deal. Speaking on RTÉ's Morning Ireland, the MP for Lagan Valley said that everyone would be better off if "half as much energy" was put in to reaching a trade deal between the UK and the EU as there currently is on resolving the backstop issue. He said the DUP's preference would be to continue operating under the Good Friday Agreement, but in the event of a no-deal Brexit, changes would have to be made to it. Northern Ireland Secretary Karen Bradley told the Conservative Party conference in Birmingham that the British government will "never" allow a border down the Irish Sea. She made her comments during a devolution panel discussion in the main conference hall, watched by Mrs Foster. Ms Bradley said: "I want to be absolutely clear: this government will never allow there to be any break-up of the United kingdom with a border down the Irish Sea." Ulster Unionist Party leader Robin Swann has said messing abut with the fundamental building blocks of the Good Friday Agreement is dangerous at the best of times, but in the current situation it is fundamentally stupid. Speaking on RTÉ's Six One News, he said the UUP had negotiated the agreement and key to is is the principle of consent, which is the foundation that ensures Northern Ireland remains part of the UK. He said Mrs Foster's statements had put Mrs May in a more precarious position in the negotiations because they reinforce the argument that Brexit is a threat to the Good Friday Agreement and this is not the case. He said any kind of regulatory check in the middle of the Irish Sea is the same as a border and this would remove Northern Ireland as an integral part of the United Kingdom and this would not be acceptable to Ulster Unionists. Elsewhere, Sinn Féin's finance spokesperson Pearse Doherty also described Mrs Foster's comments as "reckless" and said the Good Friday Agreement would not be used as a bargaining chip to try to resolve the "mess" that the DUP and the Conservative Party were in. Speaking on RTÉ's Today with Seán O'Rourke, Mr Doherty said the Irish Government, as co-guarantor of the Good Friday Agreement, needed to say that changing it was off the table. Mr Doherty said he believed that many people in Northern Ireland voted against Brexit because of the dangers it posed to the agreement. Responding to Mrs Foster's remarks, Labour Party leader Brendan Howlin said: "Any comment that seems to belittle, undermine or move away from the Good Friday Agreement is profoundly worrying. Everybody knows the sweat and the blood that went into creation of that settlement." President of the European Commission Jean Claude Juncker has said the EU is committed to sticking to its policy of "Ireland first" in the current Brexit negotiations. He was speaking as MEPs in Strasbourg debated preparations for a key EU Brexit summit later in the month. Mr Juncker also told MEPs that the EU wanted a deal, and warned that those who were suggesting a no deal Brexit were not aware of the difficulties this would bring. She said the EU was making "impossible demands" and that the idea that Northern Ireland would allowed to become a "semi-detached" part of the UK was "offensive and outrageous". The leader of the parliament's Brexit negotiating team, former Belgian Prime Minister Guy Verhofstadt, warned against any extension of Article 50, saying this would only bring further uncertainty.